Skills and Abilities: Proficient thief and street fighter. The only daughter of the famous thief “Teacher” who was a surrogate father to many orphans in Africa. She was a sort of leader among her peers due to being “Teacher’s” daughter and because of her gruff and aggressive personality and proficiency as a thief. When her father welcomed a blue eyed white haired girl into the fold she immediately hated her. Teacher showed preference and favoritism to Ororo and this made her Kenja’s target at every turn. One day while out with Ororo and others she dared Ororo to steal a camera from an American then deliberately tripped Storm when making their escape hoping to be rid of her [Storm #1]. Ororo still escaped however much to her dismay. That night hunters came looking for Ororo and Kenja lead them to her [Storm #1]. She saved Ororo surprisingly despite their rivalry. They were saved by a young T’challa who was on his walkabout [Storm #2]. Kenja was hopeful that the prince would fall for her but instead found all his affections lavished on Ororo this enraged her [Storm #3]. When Storm and T’challa left the camp to travel together she confronted her father about Storm’s abandonment, how he wished Ororo was his daughter and how he would rather T’challa be with Ororo than his own flesh and blood. Their settlement was then attacked and her friends killed, herself and her father beaten as poachers searched for Ororo. Bloody and beaten she agreed to lead them to Ororo and lamented to her father all her friends were dead and her home burned all because of Ororo [Storm #4]. 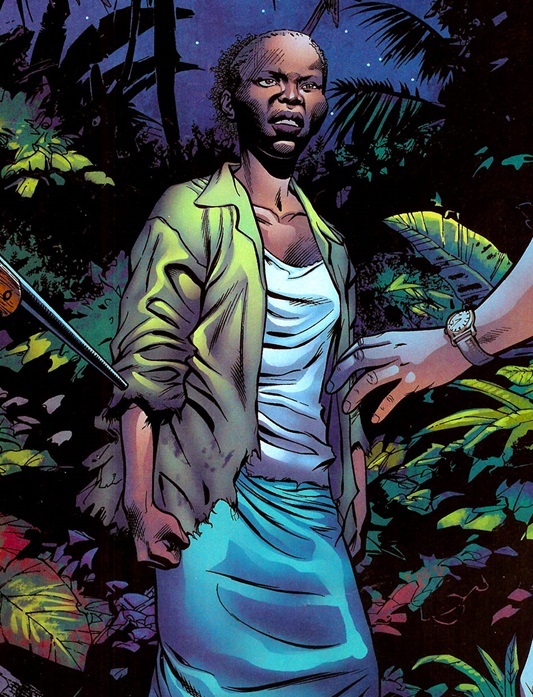 When her father revealed he was born in Wakanda he was thrown from the helicopter further traumatizing her [Storm #4]. When Ororo was captured she offered herself to one of the soldiers in hope of not dieing and hoping to get revenge on Ororo when they refused to butcher or abuse her the way they had to her father and friends. Upon being loosed from her bonds she killed the soldier and prepared to kill Ororo [Storm #5]. After freeing Ororo she chased her down before she went in for the kill. Her revenge was fleeting as Ororo escaped her by electrocuting her with her powers. When she regained consciousness she watched as Ororo and T’challa left her world broken and fractured captured by the enemy [Storm #6].